I respect Claire and I believe she wrote an extensive article that chronicles the launch of one particular startup and also featured supporting quotes from those PR professionals who are helping to usher in a new breed of corporate communications. While an exposé makes for an interesting read, PR is undergoing a much more significant renaissance that receives almost zero attention in this article. P.R. in Silicon Valley is far more sophisticated and effective than what’s actually spotlighted in the story and it’s much more potent than most entrepreneurs, investors, and executives realize. 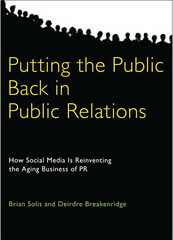 For those truly seeking answers and guidance in regards to the new landscape of PR and influence, please consider my new book with Deirdre Breakenridge, “Putting the Public Back in Public Relations.” There’s a reason we spent an entire year writing it. Anyone practicing communications, marketing, public relations, advertising, branding, or making sales and marketing decisions on behalf of any company would be remiss not to have read and shared this book. It is the most comprehensive, accurate, and practical resource on the subject of PR 2.0 and how the Social Web has transformed the world of communications, word of mouth, and authority. And, it will be relevant and poignant for years to come. I met with Claire a few weeks ago while she was working on this article and to be honest, the elements that surfaced in our conversation offered far more value, insight and direction for both PR practitioners as well as company executives seeking to rise above the noise in traditional and social media. Perhaps it’s merely shelved for a future article, but unfortunately, now’s the time to place the focus on what works, what’s changing, and how to contribute to the (r)evolution instead of simply talking around it. As my quote in the New York Times alludes, PR is much more than what most think it is. While it’s clever, even the headline of the NY Times article suggests “spin” in the era of the Web. But as my book highlights and as discussed with Claire, what’s going on right now, is so much more important than what PR used to be – even though it’s still practiced today. This is about putting the public back in Public Relations, nothing less, nothing more. In response to dissatisfied clients and huge shifts in the media landscape, a new breed of publicist is emerging, says Brian D. Solis, a P.R. guy who writes a blog called PR 2.0. His firm, FutureWorks, has a broad definition of “writer,” a category that includes those in mainstream media as well as the tens of thousands of bloggers and Twitter users who have developed avid followings by writing about niche topics. “Mommy bloggers are the new TechCrunch; they’re such an influential crowd,” Mr. Solis says. Actually, what I said was that Mommy Bloggers are becoming as important to brands as TechCrunch is to tech companies. Instead of calculating the impressions an article gets by estimating a publication’s circulation and pass-along rate, Mr. Solis counts the number of people who tweeted about a company and their combined following, the number of retweets or clicks on links, as well as traffic from Facebook and other social networks. Picture this…the few paragraphs above are merely a snapshot that represent only a few minutes from a fascinating dialogue that spanned over the course of one-and-a-half-hours. As the New York Times article leads you to believe, everything in PR focuses on the launch or a news event, however, the launch vehicles, mouthpieces and corresponding opportunities have changed and extended thanks to the socialization of media. But what hasn’t changed is the process of connecting information to people seeking it, when, where, and how they ask questions, learn, and communicate. The only difference is that the tools and the people involved in the decision making process have augmented. Therefore, we as “experts” must compensate for rapid evolution and first determine where we need to be today, tomorrow, and next month, and then reverse engineer the processes, languages, and channels of influence in order to effectively reach influencers, peers, customers, where, when, and how connect – tapping into individual instances where they seek information, offer advice, and share the things that move them. Herein lies the problem with P.R. It is at the very least, misunderstood, under estimated, misused, and most importantly, under appreciated. And, the article only perpetuates the notion that PR is an instrument for pushing “news” when what we’re actually purporting now, is the reality that PR offers so much more. P.R. does not stand for press release, yet it is only valued or consulted when news is imminent. Therefore, the press release has become the “go to” tool for telling company stories when it has something say. P.R. is not spin. The difference between PR of yesteryear and Public Relations of today and tomorrow is our ability to understand the pains and challenges of our customers and connect our value proposition to those specifically looking for it, where they’re looking for it. Our job is not deceive or mislead stakeholders. Our job is to establish an interactive channel where we share and learn, directly participating within the markets that define our business. And, we not only engage, but we also listen to and absorb feedback in order to have a meaningful impact internally that ultimately engenders a more customer-focused organization that’s in tune with the needs of valuable users. P.R. is not publicity. The idea that news is the focal point of P.R. is shortsighted and the notion that we’re purely publicists is insulting. There’s a difference between getting people to write about your company or product and building a market around it. In the era of socialized media, you should concentrate on the latter. Please note, there’s a stark contrast between the role and associated qualifications and experience of a publicist and someone in Public Relations. You may need both, but they’re rarely one in the same…and that’s the point of this post. P.R. stands for Public Relations and therefore begets relationships with the greater communities of influencers and users who can help extend the story, intentions, value, and sentiment as a means of driving awareness, building communities, and empowering advocates over time. The type of PR described in the New York Times assumes a standard launch strategy tied to a one-time event supported by the tactics of distributing the official press release or related information. In this case, only the players involved and the channels they use represent the recognition and incorporation of new media influence. However, the goals were similar to that of traditional publicity. Create a big launch. Generate a ton of visibility. Drive traffic. Spark word of mouth. The only problem is that activity always diminishes if communications doesn’t shift into the next gear to extend visibility and interaction. The true value of new Public Relations is to do all of these things, but also build communities of power users who will extend the story across multiple networks in order to reduce the delta between the spike of launch activity and the valley below once traffic subsides. This is Public Relations and the foundation for a new era of direct to consumer (D2C) influence – one where WE become influential in the process of creating visibility and also supporting activity. It’s now our job to build and grow communities and therefore we can no longer hide behind the brands we represent. If you’ve studied the behavior and ensuing results associated with retweeting and linkbacks lately, you’d be surprised to learn just how few people actually click through to interact with the shared content, let alone using or referring the product or service contained in the link – no matter how influential you are. Of course, the more authority and trust you possess, the more retweets and shares you earn, but the follow-through never fails to dissipate without fuel and cultivation. This observation is shared in a recent launch comparison by Michael Arrington on TechCrunch. The point is that if we base our activity on news and events, the results will always produce spikes and valleys and the distance between them is determined by the cadence of our news releases and the effectiveness in how well we generate presence and corresponding traffic. Unfortunately as the attention of our customers continues to thin and the competition for awareness escalates, the distance between the spikes and valleys may be the difference between success and obsolescence. The trick is how to counter the balance and disparity between apex and and nadir. The answer is to create programs that match the results from the initial research of identifying the people and channels of influence within every facet of the customer bell curve – from the head to the Long Tail. I call this a “Yo Yo on an Escalator,” as your traffic can go up and down, but through a dedicated practice of community, awareness, and advocacy programs, the cumulative traffic is always going up – especially in between news cycles. It’s the difference between a campaign mindset and one of community cultivation. Extending the value proposition within multiple horizontal and vertical markets is not only beneficial, but critical for any company hoping to compete for the future. The belief that there is only one market and one channel and one opportunity for your story is not only confining, but also dangerous. Again, there is no one market for our one message. Our value propositions must speak to those influencers and decision makers looking for information that speaks specifically to them, understanding not only what galvanizes action but also pays homage to their unique needs and experiences. These individuals represent the landscape of traditional and new media authorities that occupy mainstream and niche markets and form a pyramid stacked on varying degrees of leverage. It’s our responsibility to identify and prioritize all important categories equally in order to run both a top-down and bottom-up communications program that increases visibility, demonstrates awareness and empathy, offers solutions, and inspires champions who can help us extend and scale explicit benefits for particular groups of consumers. In doing so, we can create a series of concentric circles that, when nurtured individually, resonate and extend until they collectively overlap and form a topography of collaborative, burgeoning and overlapping conversations and communities that extend the reach of companies to cultivate dedicated channels. In the end, relationships and expertise serve as the currency of PR and influence and without them, the ability to connect stories, earn trust, empower advocates, and build vibrant communities is implausible. The eligibility to earn these relationships however, start with a completely new and enlightened state of market awareness, customer empathy, and social adeptness, bound by passion and a clear proficiency in the art and science of influence and community building.